What the shizzle is Setsubun? Celebrated annually on the 3rd of February, Setsubun refers to the transition from one season to another, though in this instance specifically to the joyful hop from Winter to Spring. Realistically it is a little early to be celebrating such things, as much of the northern swathes of the country are still blanketed in snow! Nevertheless, Japanese look forward eagerly to Spring and its association with the universally adored cherry blossoms. Originating with a similar Chinese custom and linked to the Lunar New Year, Setsubun is also all about starting the year afresh, which involves ridding oneself of past evils. These evils manifest themselves as demonic oni, comparable to the ogre in the West. How do revelers achieve this new, evil-free start? In a number of mad and mysterious ways. These days people all over Japan visit shrines and temples during Setsubun, where priests and important people like celebs and sumo wrestlers stand elevated and lob beans and other charms all over them. Revelers desperately try and catch these missiles of fortune as they are considered great luck for the beginning of the year. 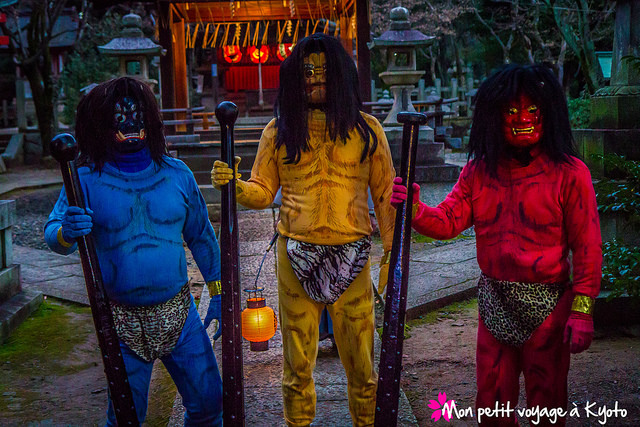 At these events, folk dress up as oni and go around gently hitting shrine attendees with branches, to which the battered folk turn and say “arigatougozaimasu” – as this process imparts good luck. You might think this is all a bit odd, but you could say the same thing about a day honouring the pancake, maypole dancing or hunting easter eggs hidden by an oversized rabbit. This purge ensures the year ahead will be blessed with good luck and no pesky demon oni causing trouble and destruction. Subsequently, mamemaki participants eat the number of roasted beans that corresponds to their age at the time. As you can imagine, this is all jolly good fun for the young whippersnappers but can quite literally be a sickening experience for the elderly, physically and emotionally. Many items, like our rather dashing oni mask, pop up all over Japan to purchase before Setsubun. Finally, families pop up a decoration in their doorways made from garlic cloves, onions, twigs of hiiragi (holly) and iwashi (a sardine-like fish) which is said to give keep the oni away for good. How? The fishy smell may entice them, but the hiiragi will sting the curious critters right in the eye, sending them back away from whence they came (again, definitely feeling sorry for these little oni). Now you’ve seen how delightfully bonkers and fun Setsubun can be, why not get involved this year? Grab your oni mask from Japan Centre Online or oni mask and beans from Japan Centre in store, rustle up some maki sushi and join the Setsubun revolution! 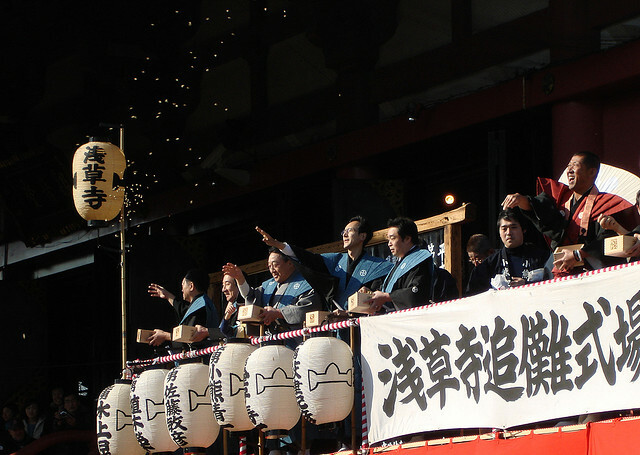 Posted in Uncategorized and tagged japan, Japanese festival, lunar new year, setsubun. Bookmark the permalink. Ahahah!!! Throwing beans to chase demons!!!! We can only see that in Japan!! !